Chris got started by studying marketing in college, focusing on eCommerce. He’s worked for several companies doing marketing, including several startups in San Francisco. Chris eventually moved back home to Phoenix where his family is from and worked in marketing for a local company. When his wife’s brother-in-law started a small flannel business and needed some help, Chris jumped in and started working part time with Dixxon’s marketing and supply chain. The company now offers everything from their original flannel shirts to board shorts. All the production for the company is outsourced. Dixxon Flannel tries to keep as much domestic as possible, but in order to offer competitive pricing the company has to outsource much of the work overseas. Wholesale and Direct sales people work in the USA as well as all the pick, pack and ship. All the marketing is done in house. The owner does all the social media in house and Chris assists with email marketing. They like to keep much of their marketing focused on branding, not sales. They see sales in the $10-20k based on brand promotions. 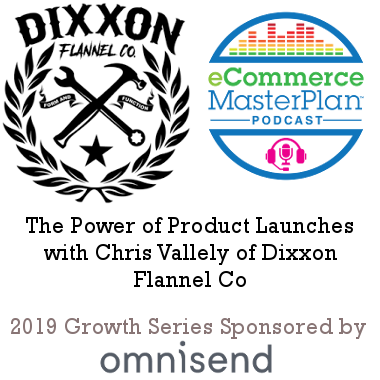 Listen to learn how Dixxon flannel uses flash promotions to sell their product. Nearly every product Dixxon sells is limited edition. The company builds up excitement around each new item, generating buzz around that product and then they release it at a consistent time (5pm). The company averages 2 product releases a month with 3-6 colorways or styles, with more around the holiday. The company is strategic about the variety of their offering. Varying colorways and style as well as women and youth styles are all a part of the overall strategy. Depending on the popularity of the product, the entire line can sell out in as little as a few hours. Other products stay on the site for as long as a month. For those products that stay in stock longer, the company tailors their marketing strategies to help move those products. New, limited (scarcity) and urgency are all great ways to sell. If you have an established business, it’s important to ease into offering limited editions and if you want to launch based on scarcity, it’s important to build the brand before you build the product. By keeping offerings limited, you can then build more excitement for the next launch. Businesses also have to deal with customer disappointment but Chris says that they’ve started to do some anniversary re-releases. In order to keep from disappointing original purchasers, Dixxon will tweak slightly the second releases with different buttons, tags etc. Dixxon uses Shopify and they’ve traditionally reached out to them to let them know that their will be a surge coming but now Chris says Shopify just expects the surges to happen. The only problem they’ve had has been with stolen cart items, but Chris says they’ve taken steps to ensure customers know that their time is limited. Overall, he says that Shopify has kept them covered during all of their surges. Dixxon uses Omnisend for their email promotions. The company sends out a pre-launch newsletter. The first time they did this, the results were 30% open rates and 12% click rates. Today, 15-25% of overall revenue is coming from email campaigns. The automation in Omnisend is generating a good amount of money every month. Email templates and automation make the analysis paralysis disappear and email campaigns become much more useful. They also use templates for targeting customers for specific products, which is a process that Omnisend automates. While user segment information can be pulled from Shopify, Omnisend makes it much easier. Focus on your Brand, not your sales. It might take a little bit longer, but you’ll grow a stronger brand.